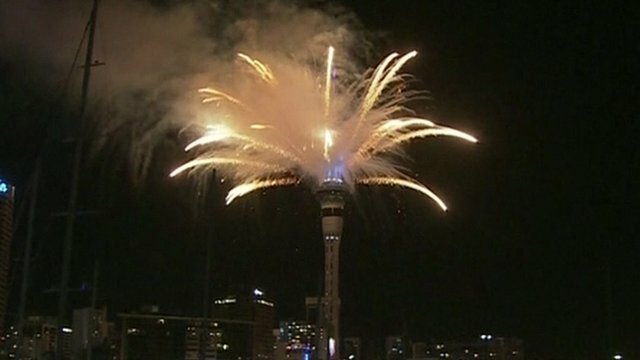 New Year 2014 celebrations are beginning with Auckland in New Zealand ringing in the New Year at 11:00 GMT on Tuesday. Crowds have gathered in Sydney, Australia, in anticipation of the city’s famous firework display. In Japan, Shinto priests gathered at shrines to prepare to usher in the new year. Other cities globally are also planning big displays, with Dubai attempting a world record for the largest display. The display will be streamed live on the internet and organizers say it will stretch over 30 miles of seafront, with the highest fireworks reaching more than one kilometer in height. While celebrations are expected in major Chinese cities, the city of Wuhan called off its display in order to avoid worsening the city’s smog problem. Later on, festivities will be held in European cities including Moscow, Paris and London. Cape Town in South Africa is planning a free concert with lasers, fireworks and a special 3D tribute to former President Nelson Mandela, who died on 5 December. New York will mark the New Year with the traditional New Year’s Eve countdown and ball drop over Times Square, while Rio de Janeiro is once again expecting more than two million people to pack its Copacabana beach.